Ocean view condo just steps away from the pool & on site restaurant. From the moment you enter this luxurious East End St. Thomas vacation rental, you will head straight to the private covered gallery to enjoy the unobstructed island views. From dawn to sunset, you'll be mesmerized by the every changing color of the gorgeous water of Philsbury Sound and Atlantic Ocean. This large well appointed suite is immaculate and comfortably furnished. Its cozy decor gives you the feeling of being in a 5 star resort: Enjoy a comfortable queen bed, sofa, beautiful and luxurious bed and bath linens. This studio suite has everything: free in-room WIFI, a NEW, quiet, split air-conditioning system, 32' flat screen TV, Cable, DVD/VCR combo and a fully equipped kitchen for those nights when eating in is desired. A hop, skip and jump to the main pool and pool side restaurant and bar. Stroll around the marina, cruise around St. John or to BVI on one of several boat charters, enjoy riding jet skis or sunbathe and snorkel at white sand Sapphire Beach, which is a mere 300 steps away! My sister & I both love Saint Thomas and want to share our piece of paradise. see beautiful views of St. John, Tortola and all the Keyes! Just look outside your door! just a few steps from your door, located next to Sapphire Grill. Drinks poolside! Lounge chairs and tables available. Kitchen has everything needed to prepare meals. Beach chairs, cooler & beach towels provided for your use. There is a grill near the pool that you may use if you desire to grill. Had a wonderful time and I love staying at Sapphire Village! I love the location of this condo. Within the Sapphire Village complex the building is directly over the marina, which I thoroughly enjoy. It is close to the quiet end of the marina. The other end of the marina gets noisy in the mornings when the Breakaway charters start. I am happy to say we never heard them in the morning. The condo is well equipped and clean. The only thing I will complain about is the mattress as it sinks in the middle. We solved that problem by placing a pillow between the mattress and box spring. I LOVE to snorkel and there is plenty of snorkeling equipment in the condo to use along with beach towels, etc.. As stated in the advertisement, the condo is well equipped! Sapphire Beach is really nice and has good snorkeling. I even saw an octopus which was a huge surprise (both for it and for me). The condo is close to the restaurant and pool within the complex. The restaurant is delicious and certainly popular. The view from the condo cannot be beat. I love looking out at the islands. Sapphire Village is close to Red Hook and the ferry. In my opinion the complex has the best location on the island. If you do not rent a car getting to Red Hook or Charlotte Amalie is easy. You can walk to Red Hook but it is not for the faint of heart (not something wise to do at night). Otherwise the safari "bus" picks you up at the entrance of the complex. When you get on say "Good Morning" - a simple gesture that goes a long way! Getting back to the condo from Red Hook requires a taxi but it is easy and they are always around. Red Hook has plenty of restaurants if you are not interested in cooking otherwise the grocery store is across the street from the ferry. The safari will take you to Charlotte Amalie for $2.00. You can experience a day there and then get back on the safari and return to the condo for another $2.00. So worth it! Stay on St. Thomas and go enjoy St. John! Affordable way of enjoying the islands. My favorite beach to snorkel at on St. John is Salt Pond. On week days you can take the local bus from the ferry dock at Cruz Bay and ride to the other end of the island for $1.00. Runs every hour and the last stop is at Salt Pond Bay past Coral Bay. Beautiful! Waterlemon Cay on the North side has great snorkeling as well and Annaberg Plantation is a really nice place to visit. Tour the ruins, hike to Waterlemon Cay, and then enjoy the snorkeling. So many great beaches on St. John, not enough time . .
Wow! Thank you so much for such a lengthy review. I really do love guest feedback. I specifically purchased in the SABA building at Sapphire Village due to its water and far end of the marina location. Not too loud but you still get the views and the boat "action." In all my time, I still have not seen an octopus! Sounds like fun. Thank for your mentioning the mattress. I had had a renter mention that approximately a year ago or so and have asked every tenant since as the mattress was purchased in 2012. I will be getting new furniture and mattress when the condo is renovated this summer. Thank you for the private feedback as well. Safest travels in the future! Ocean Breeze, perfect name for this place! 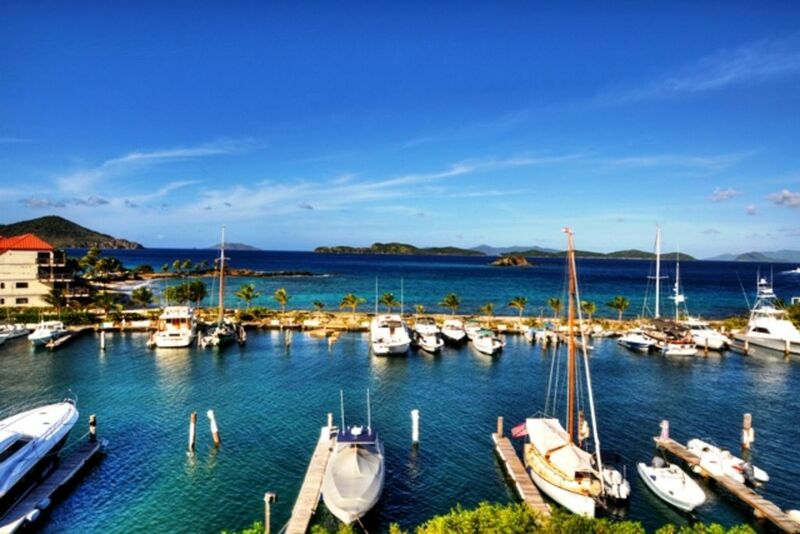 This was our first trip to the USVI and staying here in Saphire Village was the perfect "starting off point" for all our adventures in St. Thomas and St. John. Red Hook where the ferries take off to St. John is just around the corner. The views from the condo are beautiful. You overlook the marina and the Caribbean ocean!. The condo has just about everything you need. The VI Slice (restaurant) is steps away and one of the best beaches is a short 3 minute walk. We would fully recommend this place to travelers. Ocean Breeze is an incredible place to stay on St Thomas! Great location right on the marina & the best beach on the island, Sapphire Beach. My boyfriend & I enjoyed everything about it. Access to a free beach, very close to Red Hook (take the ferry across to St John!!) & private/quiet area where we felt very safe. Marie was very helpful & her system of doing things work very well. We were able to check in early & we really appreciated that after our long flight! Thanks again Marie! Very nice and clean with wonderful view from the balcony. We stayed on the second floor of the Saba building. The condo is in a very nice part of the island close to a superb beach and marina. It has a single large (king size?) bed and a sofa that can be used to sleep on if you are not too tall ( I am 5'10"). I lost the coin toss with my brother and was a happy camper on the sofa for the entire stay using a doubled sheet and a cover from the proper bed. Would be nice to have a couch that converted to a bed with dedicated linen and a blanket. All appliances worked fine including the new WIFI router. We used the kitchen for most of our meals, went to the restaurant/bar by the pool and walked (as many noted no sidewalks, so you need to be agile to dodge the cars zipping by, walk on the right side so you can see them coming) to Red Hook for a few meals, all very good. We found some nice snorkeling spots along the rocks on the right side of the beach. We also splurged on a day charter on the Night Wind to St John and enjoyed the sail with breakfast and lunch on board and excellent service by Rick and Kathy and snorkeling on more beautiful beaches. We had a compact rental car from the airport and got used to driving on the left side of the narrow and curvy roads, even took it across on the barge to St John and explored that as well, found some really gnarly sections of road (goat track) back up from Coral Bay. Did not care too much for the snorkel trial at Trunk Bay by the way. We took a day to explore St Thomas by the mountain roads and happened to find parking by Blackbeard's castle (that was closed for the Easter holiday) and walked around in Charlotte Amalie for a while, had lunch at a cruise dock restaurant and hiked the water front back to the 99 (103) steps back up to the castle. Recommend getting a rental car you can take to St John on the barge (check with the rental agency first) to explore St Thomas and St John. The map application on my phone was very helpful, download the maps before you go to save on data charges. Marie was very easy to work with and emailed 3 full pages of instructions and recommendations for our stay before we arrived. We recommend this property to anyone interested in staying on St Thomas, it is awesome! The area is great. Close to Red Hook and Ferry to St. Johns which is amazing. Sapphire Beach itself is excellent with great snorkeling. We did not rent a car, just used taxis which worked great for us. Most days we didn't leave the property. When we did, taxis were very easy to access and helpful. Don't recommend walking the narrow dangerous road to and from Red Hook. The condo was clean and very well stocked. The view from the lanai is tremendous. We bought fresh fish from the fishermen as they arrived back to the dock. Definitely we'll be back. Nice pool and little bar and restaurant across the parking lot. Pictures were accurate. Communication with Marie was prompt and very helpful. We'll definitely be back! The place was clean and stocked with tons of goods and utensils. Neighbors were all welcomeing aswell. Never had issues with the Internet or hot water. Next time we will rent a car but the ferry to St John is so close it's not a necessity! Thank you and can't wait to come again! Waken to a beautiful view of the ocean. You can enjoy a leisurely 300 step walk to the beach. There are two pools located nearby, one is just outside the door of this condo! Red Hook is a mere mile away for nightlife, ferries, dining, dancing and bars. St. John is a short ferry ride away. This condo and location has all you need for a tropical getaway!